The birds are silent in the woods. The troubling antonymic tensions between rest and unrest drive our fascination with Goethe’s poem, our theoretical reflections, musical recompositions, revisions and remix. In November 2016 I participated in a seminar entitled “Lyric Matters” at the conference of the German Studies Association. Poetry scholars across the US gathered and asked “why the lyric genre mattered in the past and what its renewed relevance tells us about our own present and our scholarly practice.” Seminar contributors explored the relation between the poem’s “concentrated (verdichtete) appearance” that is the actual space on the page and its temporality, its organization of time as it creates “meaning that is not accessible outside of the poem.” I examined the topos “Ruhe” (calmness, peace, quietness) in Johann Wolfgang Goethe’s “Wandrers Nachtlied” and “Ein Gleiches” and its revisions in 20th century concrete poetry. I am now thrilled to expand this discussion to include also reflections on musical re-compositions and data-driven remixes of the same poems. At the University of Oregon I collaborated with my colleagues Professor Stephen Rodgers and digital sound design performer and composer Chi Wang on a panel entitled “Revising and Musicalizing Goethe’s ‘Ein Gleiches’”. COLLATERAL invited us to design a cluster on “Ein Gleiches” and to present our professional and also associative investigations into intermedial arts about Goethe’s concept of “Ruhe” and “ruhen” and its revisions and recompositions. We are thrilled to present our individual research as it covers 19th to 21st century poetic and musical experiments (theoretical and artistic), and use this research also as theoretical framework for engaging into discussions about the multi-interpretability of artifacts like “Wandrers Nachtlied” by the artistic duo Evelin Brosi & Tijl Moons. Our thinking is informed by listening to Chi Wang’s remix of Goethe’s song, and we are honored that Professor of Music Technology and Director of Future Music Oregon, Professor Jeffrey Stolet joined our discussion of the semiotics of “Ruhe “and “Unruhe” in Goethe’s poem. The word “Ruhe” in Johann Wolfgang von Goethe’s poems “Ein Gleiches” (1776) and “Wandrers Nachtlied” (1780)1 evokes silence as a puzzling enigma of the unknown. Sounds of nature disappear, and the reader wonders how silence is experienced: as night, death, sleep, peace? Revisions of this exposition of “Ruhe” in 20th century concrete poetry by Christian Morgenstern, Eugen Gomringer, Friedrich Achleitner and Ernst Jandl, leave nature behind and focus directly on language as the signifier of “Ruhe.” The latter poems reflect on how “Ruhe” is engrained into linguistic processes. They play with words, syllables, letters and their visual and sound effects. While Goethe’s poems destabilize ideologies of “Ruhe,” 20th century concrete poetry accepts “Ruhe’s” non-ideological realities by replacing nature motifs with visual signs, letters or syllables on the page. This essay investigates how this poetry exposes aspects of the poetic self-reflexivity in Goethe’s texts while removing nature motifs. What happens when letters, sounds and signs become autonomous? How do they challenge our orientation when we experience unfamiliar visual spaces or sonic realities? Jacques Derrida’s reflections on spectrality and ghost-like realities will assist us in grasping these riddles. In Of Grammatology2 he assesses linguistic logic while analysing the poetic borders, thresholds, abysses and spaces that “Ruhe” evokes but that cannot easily be identified or described. Derrida focuses on the silent “voice of being” ("Ruhe") and its difference from the “sensible and intelligible” aspects of language, inserting a split into linguistic presence. How is it possible to write or speak about an absent language while using language? “Ruhe” as an individual word gestures towards an absence of sound but we do not know which presence replaces the absent sound. As a result, we face a vast unknown as a frightening, unsettling and/or enchanting other. II. Johann Wolfgang von Goethe’s “Ein Gleiches"
In Goethe’s work, this unknown is associated with nature, and more precisely with the quieting down of the sounds of nature. “Ruhe” is invoked by the apostrophe of “Frieden” (peace) at the end of “Wandrers Nachtlied” from 1776. “Ruhe” and “Frieden” counter psychological unrest and turmoil, “Leid,” “Schmerzen” and “Lust.” In Goethe’s sequel “Ein Gleiches” – published in 1780 – “Ruhe” is evoked as a process, a temporal transition from the nominal “Ruh” (line 2) to the temporal “ruhen” (last line). It is first found in inanimate nature (landscape and trees), but gradually penetrates animated life: birds are overcome by it. Their “schweigen” (remaining silent) draws attention to silence in nature. The glance of the “you” moves vertically from infinite heights ("Über allen Gipfeln") down to the birds. However, the presence of the “you” as addressee contradicts the seemingly total silence. As long as the “you” is being addressed by the apostrophe, the addressee is not yet totally removed from language: “Warte nur, balde / Ruhest Du auch.” Thus, the “Du” does not yet have access to silence. The absence of “Ruh” from nature ("Über allen Gipfeln") is paralleled to the “you’s” self-alienation, its malingering from signification. The indefinite preposition “über” points to spaces beyond the earthly definition of mountain peaks, as the durative verb “ist” (being) indicates timelessness. Categories of time and space collapse, and the earth’s borders dissolve. The adverbs of space and time, “über” and “balde” inscribe uncertainty into presence and future. As a “silent, mute, insonorous, wordless, originarily a-phonic"3 voice of being, the signified is absent and the addressed “you” is losing its identity. While it is being addressed and evoked, its confines, edges and stable grounds dissolve, and it opens up to the vastness of space and time. As Jonathan Culler argues, the apostrophe “engages into a speech act without a known, real world counterpart. "4 This “speech act” operates at a threshold between extra-linguistic ("the real world") and linguistic realities. Consequently, there are several possible readings for the “you": It can function as a self-address, as an address to another speaker/listener, the address of “Frieden” in “Wandrers Nachtlied” or as an address to the reader. All of these possible addresses expect a listening other, someone with a linguistic presence or at least some kind of listening comprehension who is then ironically subjected to the absence of language and sound and to her/his own non-listening. The “du” is caught between being called upon and being exposed to nature’s quieting down. While the ideological inscriptions of nature – death, peace, and calmness – are gradually erased, the onomatopoetic positioning of u/au/a sounds (Ruh, du, kaum, Hauch, Walde, balde, ruhest du auch) stages the final exhaling of language’s sounds. Sounds and acoustic signs are disappearing in the three-way move from “Ruh” via “Hauch” to “ruhen,” from non-sound (Ruh) to sound (Hauch) to non-sounding (ruhen). The framing first and last lines ¨Über allen Gipfeln ist Ruh” and “balde ruhest Du auch” refer to “Ruhe” only negatively as an undefined entity, since the absence of sounds does not correspond to any defined presence. There is no counterpart, and we cannot distinguish one “Ruhe” from another. Twilight’s calming down of soundscapes blurs the borders between inanimate and animate nature, and the addressed “you.” While the sounds of nature, of “Gipfeln,” “Wipfeln” and “Vögelein,” disappear, the other of sound, namely visuality, is evoked. In the concrete poetry of the 20th century the absence of sound is no longer the focus of meditative semantic reflection. Instead, it is translated into the visual assemblage of words, syllables, letters and spaces on the page or into alternative sounds systems. Conventional sounds are revised into unfamiliar and often most surprising soundscapes. Visual poetry plays with the materiality of the text: phonological, morphological and syntactical sets are directly displayed and graphed onto the page. Ideologies of nature and the associations of death, peace, calmness and religiosity give way to a play with linguistic structures and their a-semantic and semantic connotations. Words retain some of their semantic references but are also stripped of their meaning, because of how they are fragmented, repeated and refigured. Ernst Jandl’s sound poem “ÜBE!”,5 Christian Morgenstern’s sound poem “Fisches Nachtgesang”,6 Eugen Gomringer’s “visuelle Konstellation” and “schweigen schweigen schweigen”,7 and Friedrich Achleitner’s “Sprachliche Demonstration von Unruhe”, humorously alienate conventional reading techniques by playing with the absence of the sublime connotations of silence and by spectralizing this absence graphically.8 While Goethe links the loss of sound to the material presence of natural phenomena, Dadaists and Vienna Modernists empty the words of complex extra-linguistic meaning and ideology, and play with them as spatial or audible signifiers. Earthly things (Gipfel/Wipfel/Vögelein) lose their voices, while syllables, letters and punctuation signs gain new ones. Ideological references of the words “Ruh” and “ruhen” are erased and linguistic signs recycled, reshaped and reformatted. Concrete poetry makes the invisible/inaudible potentials that the linguistic or poetic signs (as signs) hide visible and/or audible. For example, Jandl turns Goethe’s word “Wipfeln” into two utterances “WIPP!/---/FEHL’N’s?”: a forceful exclamation and a question. Six exclamations precede this one question, and repetitive sounds (r, l, i, p, s, r, l, n, i, e), and sound combinations (uuuhii) take over the soundscape of the poem. The articulatory qualities of the words dominate over established meanings; in fact, conventions of meaning are erased, and the sound quality of letters creates new units that combine sound and, at times, new unexpected semantic entities. The splitting of a word’s unity into two or more utterances plays with the linguistic material itself. Structural, grammatical and phonetic structures of linguistic signs are loosened and rearranged. This deconstruction of single words brings about a self-referential questioning of their own status. Words are not only viewed as semantic and poetic units, as rhyme and rhythm, but also as potentially new units that utilize sound, rhyme, rhythm and the autonomous meanings of syllables. Thus, conventional structures are dismembered, rearranged and then revived with surprising effects. Readers have to give up standard patterns of reading and engage in a playful deciphering, negotiating between sense and non-sense. Perhaps the poem’s first request “ÜBE!” even intends to initiate a new practice (Übung) of reading and thinking as it programmatically demands to play and experiment with the sounds and shapes of letters and syllables. 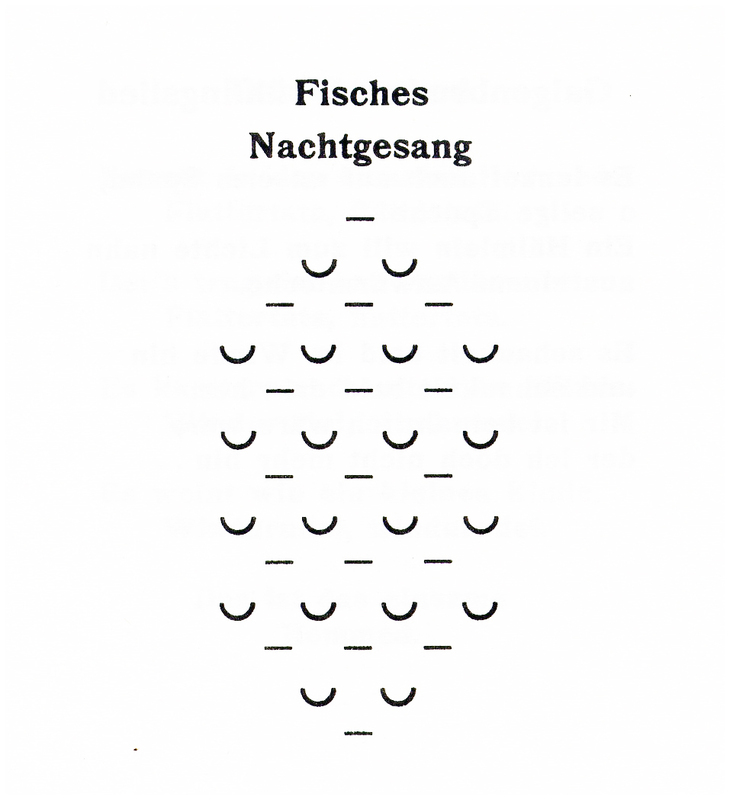 Whereas Jandl conducts both acoustic and visual experiments, Christian Morgenstern’s “Fisches Nachtgesang” (Fish’s Night Song) emphasizes the visual aspect of poetry. It confronts the reader with a double paradox: firstly, fish don’t sing, and secondly, the night is normally the quietest time of the day. Singing here is presented as a silent action. The song is not based on sound, but on rhythm alone, as it – graphically – plays with the shifts between poetic meters, such as iambs (v-), trochees (-V), amphibrachs (v-v) and abbreviated spondees (--). This silent rhythm creates a visual symmetry of 6 lines with 2 lines framing the other 4 through an upbeat/anacrusis (lines 1 and 2) and a downbeat (lines 5 and 6). The rhythms structure silence by inserting flowing dynamics. Would readers associate the rippling of the water surface? Silence moves and is visualized solely as rhythm. The absence of actual words helps the reader not to be distracted by fixed meanings. Friedrich Achleitner’s “Demonstration von Unruhe” presents silence visually but as unrest, unease, anxiety and angst. Unruhe, however, does not turn into acoustic noise. It inserts an interruption into a vertical order. The visual repetition of two words in a vertical line is disrupted by the same repetition of the words in the middle horizontal line. The horizontal line perfectly continues the repetition of words (3 times “ruh"/4 times “und”); it only contradicts the vertical order with its sharp 90 degree angle. This textual image shows semantically that Ruh, the vertical order, can only be perceived through its antonym or its own disavowal ("Unruhe") by the horizontal order. This is highly ironic because Ruh undoes itself not by becoming loud. It remains in the context of visualized quietness. This creates a tension in the midst of “Ruh:” quietness undoes itself as long as it remains in the visual sphere of the text image. Thus, ironically, quietness and noise are two aspects of quietness. As a dynamic agency, “Ruh” interrupts itself without becoming “loud.” The radical shift from the vertical to the horizontal (which is quite different from Morgenstern’s repetitive meter) creates a dynamics of unease. The concrete poems I have discussed develop a very abstract perspective on Ruhe – abstracted from the many semantic connotations that link “Ruhe” to silence, peace, death, etc., as happens in Goethe’s poem. These poems elaborate and stretch the semantics of “Ruhe” as an anti-semantics that creates visual paces where sound is absent. The text images present “Ruhe” as a rhythm of various symmetric orders. Such a poetics of “Ruhe” is further explored in Eugen Gomringer’s “schweigen", another visual poem. 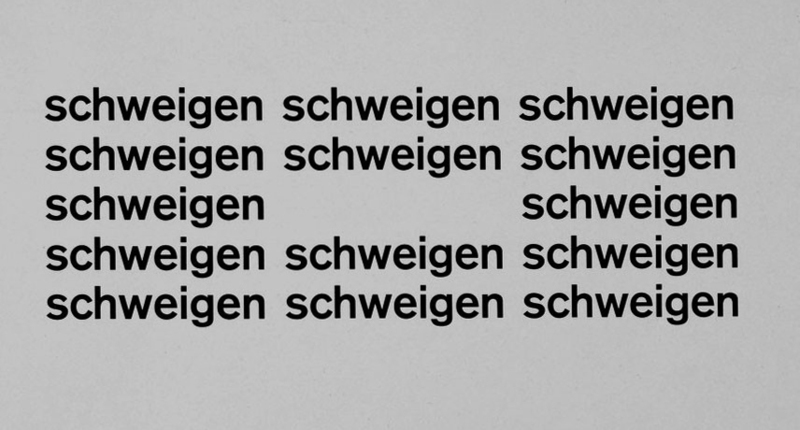 Schweigen (or remaining silent/not speaking) is invoked by an empty rectangular space in the middle of five lines that each repeat the verb schweigen three times. A geometric space for the word schweigen is left blank in the middle of the third line, where the reader is exposed to the word only as empty space. The absence of the sign translates the word into the absence of sound and pre-structured meaning. These multiple negations literally interrupt our reading patterns and draw our attention to the framing symmetry and its empty center. The blank space is the visual center of the complete poem as well as of its middle line. This intensified emptiness draws attention to a visual and acoustic enigma, to “Ruhe” as the enigma of absence. In Goethe’s context, we are dealing with twilight’s calming down of soundscapes, but in 20th century concrete poetry, nature scenes are erased and replaced by an intricate play with phonological, morphological, syntactical and symmetrical sets directly displayed and graphed onto the page. In these texts, ideologies of nature and the associations of death, peace, calmness and religiosity give way to play. The poems experiment with the absence of sound and pre-structured signs, and spectralize these absences graphically by creating a new visual presence. The sublime connotations of the absent voice of silence in Goethe’s poem are replaced by a playfulness that presents silence as a challenge to think beyond its pre-given concepts. “Ruhe” opens up a space for spectral or ghostly appearances, but in the context of our discussion it is too restrictive to think of ghostly as supernatural, otherworldly, eerie and spooky. Rather, Ruhe as a ghostly moment initiates the experience of a secondary reality that exceeds all semantic and/or ideological fixations. For assessing the theoretical and artistic implications of secondary realities as they are evoked by the visual and rhythmic assemblages, interruptions and rearrangements of words, syllables and spaces on the page in the poetry I have discussed Derrida’s concept of the specter has to be further explored. In the essay “Spectrographies” that Derrida published together with Bernard Stiegler, Derrida discusses photos of faces as presentations of the absent, the past, the dead. He points out that the viewer cannot re-appropriate the experiences that are inscribed onto these faces. They are absent and gone. However, the photo spectralizes this absent past and thus Derrida demands “respect for the alterity of the other", “for the ghost (le revenant) and, therefore, for the non-living” (42). Ghostly appearance in this context is different from the poetry we are discussing. Instead of photographed faces as relics of a past life we are dealing with linguistic fragments, letters or words on a page. These words’ connotations die, but their corpses (signs) are revived. In concrete poetry spectralization and musicalization go hand in hand, prompting a rewriting of Derrida’s sentence “It (the specter) is of the visible, but of the invisible visible, it is the visibility of the body that is not present in flesh and blood"9 to “It (the specter) is of the visible, but of the invisible visible, it is the visibility of an alphabetic sign that is not a grammatical, linguistic or semantic unit anymore." The opening chapter of Derrida’s Of Grammatology is very instructive here as it lets the established dualisms between signifier and signified, letter/word and meaning/ideology collapse. Derrida points to “imperfections of alphabetic writing” as ways to “re-appropriate presence. "10 Presence and being cannot be grasped, language is “exhausted,” book and speech are dead.11 Derrida’s words for the “death” of speech and book are elaborated by many more phrases that point to the “ruptures” between being and sign. Derrida consults Heidegger, who argues that the “‘voice of being’ …is silent, mute, insonorous, wordless, originarily a-phonic…”.12 In this vein, Derrida reveals language as not being fit to express authentic meaning. Similarly, writers of concrete poetry give up the illusion of conventional meanings, replacing them with a play with linguistic components, syllables, syntactical fragments, sound bites, punctuation, visual constellations, etc. They radically undermine compromises in addressing language crises; instead, they invent and pose new ghostly realities. I am hesitant to speak here of “new languages” since traditional structures of reading and writing cannot be applied. But on the other side opening up potential secondary realities for language sets up many more ways to experiment. In an obscure way, these experiments started within Goethe’s texts about “Ruhe,” and as soon as concrete poetry took up this topic it heightened the linguistic aspects and poetically foreshadowed some of the issues deconstruction raised much later. While Goethe’s poems work primarily in the context of poeticized ideology, concrete poets playfully experiment with the articulated and/or visual materiality of signs, taking them apart and assembling them anew. In Goethe’s poem “Ein Gleiches” “Gipfel,” “Wipfel” and “Wald” function as visual placeholders for the voice of silence; in 20th century concrete poetry these are replaced by illogical, visual or audible combinations of syllables, letters and sounds. In other words, "Ruhe” is no longer associated with evening, night, still air and death, but rather with the written/silent sign as it adopts space, body and sign on the page. These modern poetic assemblages protest against Western logocentric ideologies and their metaphorics, blur the borders between sense and non-sense, and challenge the reader to give up conventions of reading, thinking and perceiving reality. Visual disappearance and the erasure of sound open up possibilities for restructuring and initiating an enigmatic otherness of writing and reading. This liberation from semantic and ideological fixations is a goal of visual and sound poetry.13 Goethe started the process in the context of deconstructing conventional poetic ideology, and then 20th century poets explored this goal by also loosening linguistic logic and semantic structures. Derrida calls the “death of speech” a metaphor: “before we speak of disappearance we must think of a new situation for speech, of its subordination within a structure of which it will no longer be the archon. "14 Derrida does not speak about the creation of new speech but about “a new situation for speech.” He is aware that the new actual speech act cannot be programmed; the poet designs only conditional frames for it. Derrida’s phrase articulates the potential for innovative creativity and change. Whenever concrete poetry gives new expression to syllables, graphic spaces, rhythms, etc., it creates “situations for a new speech.” Concrete poetry certainly challenges the reader (or listener) by opening up new spaces and times for “Ruhe”, its emptiness and silence. It also anticipates 21st century experiments with the soundscapes of electronic and digital media, such as Chi Wang’s remixes of Goethe’s poem, which creatively filter, time-stretch, crossfade, and loop existing performances and soundscapes. For the artistic duo Evelin Brosi & Tijl Moons opening up new perceptions of the text works differently. They seem not to be interested in studying and utilizing pre-composed musical versions of Goethe’s poem, instead they seem to create their response more spontaneously. With penetrant repetitions of rhythms and sounds they create eerie secondary realities which suggest that the idea of peace and calmness is obsolete or can only be found beyond the aggressions of sounds and rhythms. 1Johann Wolfgang Goethe, Goethe’s Werke I, ed. Erich Trunz (Hamburg: Christian Wegner, 1960), 142. 2Jacques Derrida, Of Grammatology. Trans. Gayatri Chakrovorty Spivak (Baltimore, London: Johns Hopkins UP, 1974). 3Ibd., 22 (Derrida quotes Heidegger). 4Jonathan Culler, The Pursuit of Signs. Semiotics, Literature, Deconstruction (Ithaca, New York: Cornell, 2002), 202. 5Ernst Jandl, “Der künstliche Baum,” Gesammelte Werke I, Gedichte 1, ed. Klaus Siblewski (Darmstadt: Neuwied, 1985), 488, 489. 9Jacques Derrida; Bernard Stiegler, “Spectographies,” The Spectralities Reader. Ghosts and Hauntings in Contemporary Cultural Theory (New York: Bloomsbury, 2013), 37-51, 38. 13Tobias Wilke’s essay “Da-da: ‘Articulatory Gestures’ and the Emergence of Sound Poetry” concludes by privileging sound poetry as “the form in which this process of unfolding finds its most profound, its most characteristic, and its most effective realization.” MLN 128 (2013), 639-668, here 650. In Wilke’s argument, the phrase “the process of unfolding” refers to the word “Dada” as “pointing simultaneously toward ‘nothing’ (Garnichts) and ‘eve>rything’ (alles).” Wilke claims that the word “Dada” and the cultural and aesthetic movements that it names do not actually mean or signify anything specific, “but that [they] could potentially, given the proper spatiotemporal context, refer to anything at all” (650). My argument goes one step further by outlining the relevance of concrete poetry’s play with various textual spaces (not only sounds) that disrupts poetic conventions by focusing on visual materials and shapes. In Jandl’s poem, for example, sign and signifier become more disconnected than ever. In fact, the disconnection is the focus of his poetry. 14Jacques Derrida, Of Grammatology, 8. I’d like to begin with a brief audio clip. Several weeks ago, I performed this recomposition as part of a presentation in a class on music and text in German culture. I wanted to highlight what makes the first song of Schumann’s cycle so expressive—the way he pulls the vocal melody ever upward, and pulls the phrase away from the home key, just as the poet speaks of his love "breaking forth"—and it seemed to me that the easiest way to do that was to play what Schuman might have done, and then compare that with what he actually did. Still, recomposition deserves to be studied more closely and used more widely because it raises crucial questions about the goals and methods of music analysis in general. For example, what can recompositions do that conventional music analyses can’t? How do what we might call analytical recompositions (that is, those used as an aid to analysis) differ from more creative recompositions—like the collage-like pieces of Luciano Berio, which juxtapose quotations from other works with Berio’s original music; like Hans Zender’s Winterreise: A Composed Interpretation (1993), which reorchestrates and radically transforms the music of Schubert’s cycle;6 like the original "remix" that Chi Wang discusses in her essay; or even like the poetic "revisions" of a Goethe theme that Dorothee Ostmeier analyzes in her article? In these cases, the goal may be less to make an analytical point than to make a new, stand-alone work of art (although as Chi Wang points out, and as Zender’s subtitle "A Composed Interpretation" suggests, it’s possible to do both things at once). Granted, I had to use a small amount of compositional skill to produce the recomposition in Audio Example 1, but I would never describe it as a composition, not in the sense that Chi’s piece is a composition. I would, however, describe it as an analysis—and not just a supplement to a written analysis but a bona fide analysis in its own right, an elucidation of the special formal and expressive features of the music, conveyed through music. My second, more important reason for choosing these songs is that they are strikingly similar—similar enough, in fact, to give the impression that Schumann was explicitly modeling his song upon Hensel’s. Except that he couldn’t have been: Schumann almost certainly didn’t know Hensel’s song. Hensel and Schumann did meet one another, when Fanny traveled to Leipzig in 1843 to see her brother, and Clara Schumann apparently performed her husband’s compositions for Fanny. But we can’t know for sure if Fanny shared any of her music with Clara or Robert. In any case, the encounter didn’t make a strong impression on either composer: in a diary entry Fanny said that Schumann’s pieces "did not seem very beautiful to me" (mir nicht sehr schön vorkamen);10 Schumann also wrote little of the encounter, saying only that the depth of Fanny’s mind spoke through her eyes.11 The connection between these songs, then, is likely not a matter of influence. Yet it’s also not a matter of coincidence. I don’t mean that Schumann was clairvoyant, rather that the similarities between these songs are a function of the similarities between the composers’ styles. One of my main aims in fusing together these two songs (in addition to exploring the benefits of recomposition as an analytical strategy) is to highlight those stylistic similarities, which thus far haven’t been explored. I have often thought that Hensel’s songs sound much more like Schumann’s than Schubert’s, despite that Hensel seems to have known Schubert’s songs better. Much of this has to do with the composers’ similarly fluid sense of tonality—their tendency to undermine the status of the tonic (i.e., the home chord in any given key), not necessarily with the distant modulations that we see in Schubert, but with a kind of harmonic evasiveness, where keys are suggested but not fully articulated and cadences are subtly undermined. This evasiveness is on full display in the songs in question. Hensel and Schumann make use of a compositional strategy that appears again and again in their songs: they write endings that call into question the very category of endings; their songs reach tonics that don’t feel like moments of closure. Many scholars have commented on this aspect of Schumann’s songs. Two give just a couple examples: David Ferris writes of Schumann’s characteristically "open endings," where (as he puts it) "there is closure at the end of the song, but its conclusiveness is compromised in some way,"12 and Susan Youens describes how in his song "Warnung," op. 119, no. 2, Schumann seems to have set himself the task of "mak[ing] the tonic chord un-final. "13 However, Hensel’s means of creating "inconclusive closure" and "making the tonic chord un-final" have received much less attention, even though they are just as inventive as Schumann’s, if not more so.14 A comparison of two songs of course isn’t enough to show the variety of Hensel’s and Schumann’s "open endings." But it can reveal how these two composers—who were acquainted but hardly intimate, aware of one another but not influenced by one another—relied on a favorite maneuver to tackle the same compositional problem: namely, how to find a musical analogue for a poem about the rest that you sense in the world around you but that you can only experience fully in the future—how to write a song that ends but also doesn’t. So, let’s get to some music. I’ll begin with Hensel’s song, using a bit of recomposition to show how she departs from harmonic expectations and thereby calls into question the stability of the home key. I’ll then do the same with Schumann’s song. After that, I’ll discuss my blended recomposition. Finally, I’ll close with some comments about the broader implications of this kind of analysis. 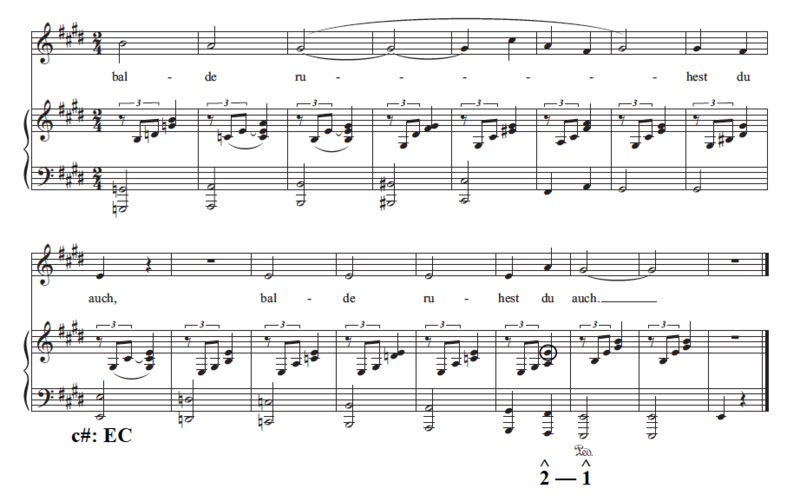 Example 1 shows how Hensel’s song might have begun, if she had done something much more conventional. (Each musical example is accompanied by an audio example, so that you can see the score and hear the music at the same time. Unless otherwise indicated, the performances were done by me.) I’ve left her melody the same and only changed the harmony. In my recomposed version the home key is clearly articulated, with a conventional I–V7–I progression. We start from a place of rest (a root-position tonic), depart from it, and then return to it. If my musical phrase were a linguistic sentence, it would start with a clear subject (the I chord), lead to a clear verb (the V chord that stretches over measures 2–3), and end with a clear object (the final I chord). Hensel starts with a less stable form of the tonic (an E-major chord in first inversion, i.e., with the third of the chord in the bass) and, more crucially, ends not with another tonic chord but with a dominant chord of another key (a V of C-sharp minor). If her musical phrase were a linguistic sentence, it would start in the middle, as if already underway, and it would end without a sense of closure. And indeed that is what Goethe’s sentence does. The sentence that stretches across lines 1 and 2 of the poem—"Über allen Gipfeln / Ist Ruh,"—begins with a preposition ("über") and, although it expresses a complete thought, it ends with a comma; furthermore, the subject ("Ruh") falls at the end, not at the beginning. (The lines could well have been "Ruh ist über allen Gipfeln.") Hensel’s opening phrase is thus the perfect analogue for Goethe’s opening thought: her musical syntax matches his verbal syntax. Aside from these syntactic parallels, what makes Hensel’s opening phrase so fitting is that it sounds at once restful (with its simple accompaniment, gentle rhythms, and normative four-bar structure) and restless (with its slightly unstable opening and unexpected turn toward a minor key). Moreover, it places the most dissonant chord on what is arguably the key word of the entire poem: "Ruh" (calm, rest)—the very thing that the addressee, or the "you" of the poem, seeks and senses in the world, but cannot experience fully. The ending of the song is similarly evasive. Example 3 shows the last two phrases of the song as Hensel might have written them, again with the melody unaltered and only the harmony changed. Notice the strong cadences in E major in the first measure of the second system (a perfect authentic cadence, abbreviated PAC, in which a root-position V7 leads to a root-position I with scale-degree 1 in the melody) and two measures before the end (an imperfect authentic cadence, or IAC, where scale-degree 3 appears above the root-position I). If I gave Hensel’s melody to my music theory students and asked them to harmonize it, this is likely what they would come up with—and they’d get an A.
Schumann’s setting of Goethe’s poem is hardly identical to Hensel’s. (The declamation, for example, is much more irregular—which, as Harald Krebs has shown, is typical of Schumann’s late songs.15) Still, it’s hard to escape the fact that the two composers interpret the poem similarly, setting it to music that is balanced on a knife edge between tranquility and unease. This is most noticeable in the way they set the end of Goethe’s poem. Like Hensel, Schumann ends without a real ending, poignantly underlining the addressee’s inability to find true rest. Here’s the ending of his song as it might have sounded had it been written in a more conventional mode. Listen for the two strong cadences on "auch" (IAC, then PAC). This is far too boring for Schumann. In the actual version he undercuts both of these cadences. The first moment of undercutting isn’t too surprising. We hear a deceptive cadence (DC—that is, a move to a vi chord rather than a I chord) in place of an authentic cadence, but with a move to an A-major chord rather than an A-minor chord. The second moment, however, is startling. The bassline slides down to E, which supports a weak first-inversion tonic rather than the anticipated root-position tonic (resulting in an evaded cadence), and the melody, rather than descending stepwise to C and giving in to musical gravity, rises a seventh to a higher C.
Example 8: Schumann, “Nachtlied,” entire song (as written). 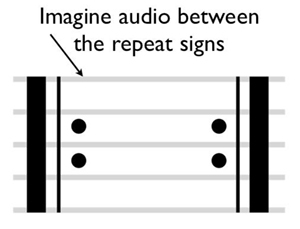 Because of these similarities—and also the similar opening and closing melodic shapes: scale degrees 5–4–3 at the beginning and 5–4–3–2–1 at the end—blending the two songs together ended up being a relatively straightforward task. What I present here is of course only one blend among innumerable possible options, but it’s the one that I think best showcases (through music) the close kinship between the songs. I will keep my analytical commentary to a minimum, with the idea that the relationships may be easier to hear than to hear described. I will, however, provide a brief road map to my recomposition. In the introduction and phrase 1, I begin with Schumann’s accompanimental texture and also his chords. I leave his chords basically unaltered, until the last bar of the first system, where instead of leading to the tonic, as Schumann had done, I borrow a harmonic device from Hensel and lead to the submediant (A minor, or vi). 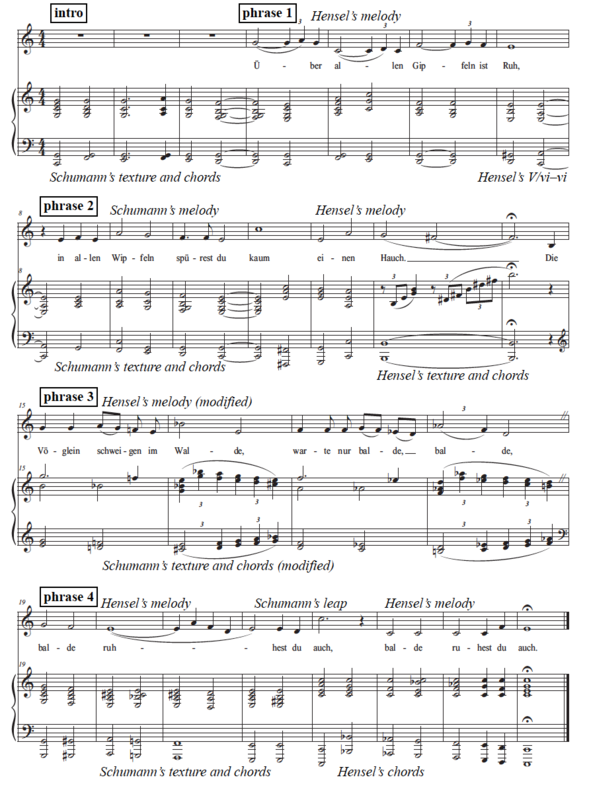 Above this I place Hensel’s melody, modifying it only slightly so as to fit Schumann’s chords (it helps, of course, that the first vocal phrase of each song outlines a descent from scale degree 5 to 4 to 3). I also introduce the characteristic triplet rhythm of Hensel’s melody. In phrase two (measures 8–14), I use Schumann’s texture and chords—until two measures before the end of this system ("Hauch"), when I basically copy Hensel’s texture and chords exactly, setting the bars in minor rather than major; fortuitously, Schumann’s song modulates to the tonic of Hensel’s song (i.e., it goes from C major to E minor, and Hensel’s song is in E major), so the temptation to basically cut and paste Hensel’s music at this point was too strong to resist. The melody in phrase two is a combination of Hensel’s and Schumann’s melodies: it starts with the stepwise descent (A–G–F–E; "Wipfeln spürest du") and leap up (to C, on "kaum") that we saw in Schumann’s song, and ends more or less identically to Hensel’s melody, save the change to minor mode. I take a few liberties in phrase three, but the end result is that this passage evokes the texture and chords of Schumann’s middle section and places a modified version of Hensel’s middle-section melody above it, fitting it to the harmony. Finally, phrase four does something similar to what I did at the beginning of my recomposition: it uses Schumann’s chords and Hensel’s melody—again, the similar 5–4–3–2–1 melodic shapes made this fairly easy. At "du auch" in the fourth and fifth measures of this system, however, I use Schumann’s surprising upward leap and Hensel’s brand of evaded cadence (V/vi—vi6). 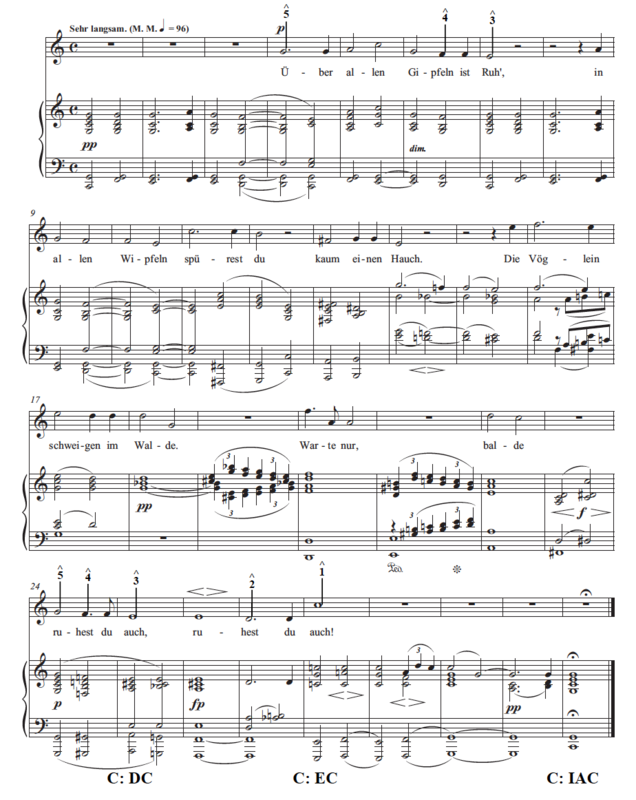 In the last three bars I borrow Hensel’s melody and chords and dress them in Schumann’s accompanimental texture. As you listen to the recording of my recomposition, you may choose to follow my annotated score, tracking how I fuse together different aspects of each song. You may also choose to just listen without a score, experiencing a piece that (if I’ve done my job right) sounds like a 50/50 blend of both songs. What does an "analysis" like this teach us? In closing, let me suggest four ways that our music analyses can be enriched by the use of recomposition. Recomposition allows for a kind of immediacy, since it requires concretizing something that might seem rather abstract. Instead of only describing the relationships between the pieces, I am forced to demonstrate them, via a combination of composition and performance. As a result, analytical recompositions may be particularly useful for conveying musical ideas to a lay audience, who can hear the connections in real-time performance but may get lost in the notes or in overly complex analytical terminology. Recall that I said this recomposition was not terribly challenging to create, because the songs were written around the same time, using a similar aesthetic, and because the links between them are so strong. This is no small point. Any attempt to fuse together two pieces or passages—two settings of the same poem, two sonata-form transitions, two structural cadences, two fugue subjects—will necessarily reveal precisely how similar the two pieces of music are. Where the task is challenging—as, for example, with Matthew BaileyShea’s virtuosic fusing of several different songs from several different eras—it will vividly reveal the extent of the gulf between the pieces, and it will require us to specify, more than we might do in a more conventional comparative analysis, what musical elements are incompatible and why. Where the task is easy, maybe even easier than anticipated, it can reveal stylistic connections that we may have sensed but been unable to articulate. Recomposition seems to me an especially powerful tool for the analysis of art song. Songs, after all, are often described as "interpretations" of poems—one might even say "analyses" of them, expressed via the medium of music. Attempting to recompose parts of a song—whether making them more normative or more unorthodox—can help us to specify exactly why a given musical "interpretation" of a poem works the way it does; it gives us something specific to compare the song with (especially in the absence of another setting of the same text by a different composer or the same composer). Finally, using recomposition as an aid to analysis can restore to analysis an element of play. Because recomposition involves composing and playing, rather than just looking and listening, it can help us and our students to learn a given musical style not by only reading about it—like learning German by merely memorizing vocab lists and common phrases—but also by using it, becoming fluent in a musical idiolect by "speaking" it, with our voices, with our hands, and with our entire bodies. 1	Music analysts most often use recomposition as a way to show how a musical passage deviates from conventional, balanced phrase structures—for example, by taking a passage that does not move in regular four-bar units, "normalizing" it so that it does, and then comparing the "normalized" version with the actual version. For a representative example, see William E. Caplin, Classical Form: A Theory of Formal Functions for the Instrumental Music of Haydn, Mozart, and Beethoven (Oxford: Oxford University Press, 1998), passim. Harald Krebs has also used recomposition extensively, in order to show how song composers depart from a poem’s normative patterns of declamation. See, for example, "The Expressive Role of Rhythm and Meter in Schumann’s Late Lieder," Gamut 2/1 (2009), 267–98, online at trace.tennessee.edu/cgi/viewcontent.cgi?article=1014&context=gamut; "Fancy Footwork: Distortions of Poetic Rhythm in Robert Schumann’s Late Songs," Indiana Theory Review 28 (2010), 67–84; and "Treading Robert Schumann’s New Path: Understanding Declamation in the Late Lieder through Analysis and Recomposition," Music Theory Online 20/4 (December 2014), online at www.mtosmt.org/issues/mto.14.20.4/mto.14.20.4.krebs.html. Furthermore, one of the most popular music-analytical methods, Schenkerian analysis, involves reducing complex passages to simpler models, and thus is based at least in part on recomposition. Joseph Dubiel has in fact described Schenkerian analyses as "fantasy recompositions." See "‘When You are a Beethoven’: Kinds of Rules in Schenker’s ‘Counterpoint,’" Journal of Music Theory 34/2 (Autumn 1990), 327. 2	See especially Hans Keller, Hans Keller: Essays on Music, ed. Christopher Wintle with Bayan Northcott and Irene Samuel (Cambridge: Cambridge University Press, 1994) and Functional Analysis: The Unity of Contrasting Themes, ed. Gerold W. Gruber (Frankfurt am Main: Peter Lang, 2001). 3	Kofi Agawu, "How We Got Out of Analysis, and How to Get Back In Again," Music Analysis 23/2–3 (July–October 2004), 267–86. 4	Matthew BaileyShea, "Filleted Mignon: A New Recipe for Analysis and Recomposition," Music Theory Online 13/4 (December 2007), online at www.mtosmt.org/issues/mto.07.13.4/mto.07.13.4.baileyshea.html. 5	William O’Hara, "The Art of Recomposition: Creativity, Aesthetics, and Music Theory," PhD diss., Harvard University, 2017. 6	For more on Berio’s and Zender’s works see James Wishart, "Re-composing Schubert," in The Musical Work: Reality or Invention?, ed. Michael Talbot (Liverpool: Liverpool University Press), 205–30. 7	See, for example, Jon W. Finson, Robert Schumann: The Book of Songs (Cambridge, MA: Harvard University Press, 2008), 235–38. 8	Eric Sams, The Songs of Robert Schumann (London: Faber and Faber,  1993), 242. 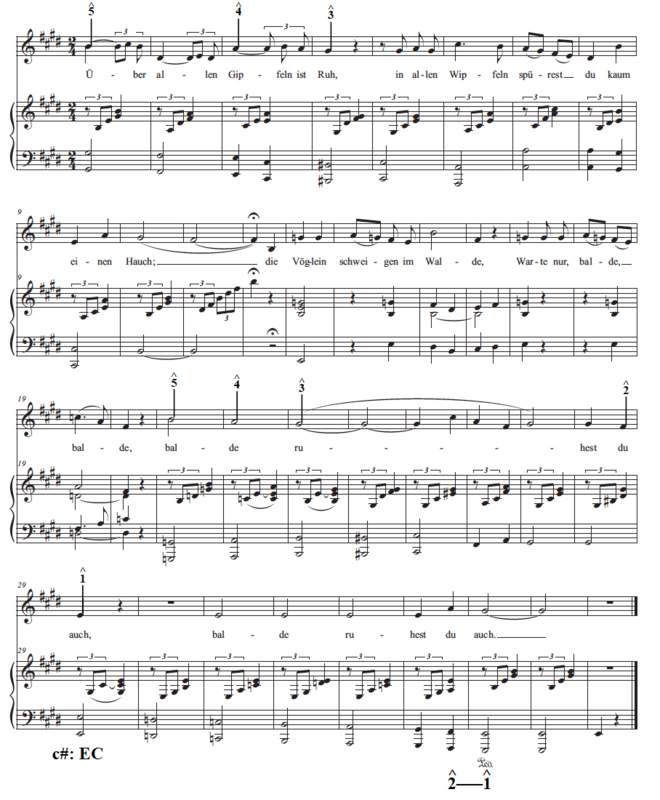 9	The song was first published in Fanny Hensel, Ausgewählte Lieder für Singstimme und Klavier, vol. 2, ed. Annette Maurer (Wiesbaden: Breitkopf & Härtel, 1993). For a brief discussion of the song’s tonal ingenuity (not in the context of recomposition and Schumann’s setting of the text), see Stephen Rodgers, "Fanny Hensel’s Lied Aesthetic," Journal of Musicological Research 30/3 (2011), 188–94. 10	Fanny Hensel, Tagebücher, ed. Rudolf Elvers and Hans-Günter Klein (Wiesbaden: Breitkopf & Härtel, 2002), 222. 11	Robert Schumann, Tagebücher, vol. 2 (1836–1854), ed. Gerd Nauhaus (Leipzig: Deutscher Verlag für Musik, 1987), 266. 12	David Ferris, Schumann’s Eichendorff Liederkreis and the Genre of the Romantic Cycle (Oxford: Oxford University Press, 2000), 106. 13	Susan Youens, "The Cry of the Schuhu: Dissonant History in a Late Schumann Song," in Rethinking Schumann, ed. Roe-Min Kok and Laura Tunbridge (Oxford: Oxford University Press, 2011), 47. 14	For a discussion of Hensel’s tendency to undermine the tonic in her songs, see Rodgers, "Fanny Hensel’s Lied Aesthetic." 15	See Krebs, "The Expressive Role of Rhythm and Meter," "Fancy Footwork," and "Treading Robert Schumann’s New Path," as well as "Meter and Expression in Robert Schumann’s Op. 90," in Rethinking Schumann, ed. Roe Min Kok and Laura Tunbridge (Oxford: Oxford University Press), 183–205. In this essay, I will explore some of the recomposition and remix techniques that I utilized in my new electroacoustic work, which is based on audio recordings of performances of Fanny Hensel’s and Robert Schumann’s settings of Goethe’s poem “Ein Gleiches.” The performance of the Fanny Hensel’s setting is by a soloist from Dortmund University Chamber Choir, accompanied by Willi Gundlach, and the performance of Robert’s Schumann’s setting is by Christine Schäfer, accompanied by Graham Johnson. The techniques and goals of a remix, however, are different. Above all, the basis of a remix is not the notes of a musical composition but the sounds of an audio recording. In 1985, John Oswald coined the term “plunderphonics” to describe music made by extracting audio segments from existing recordings and by modifying and recombining these segments to make a new composition.2 My work could be described similarly. The two elements—notes and sounds—might seem to be nearly identical, but in fact they are fundamentally different. The notes of a composition are separate from their timbre, their duration, and their volume. The sounds of an audio recording, on the other hand, contain a multitude of relationships involving pitch, duration, timbre, and other musical attributes that are inextricably entwined. So instead of varying the melodies and harmonies of an existing musical work, as one might do in a recomposition, in a remix one is apt to use techniques such as crossfading, filtering, looping, time-stretching, granular processing, or in some cases literally reversing the sound in time. This, then, is one of the main differences between my project and Stephen Rodgers’: my creative work arises from direct consideration of audio recordings of performances of the songs rather than from traditionally notated scores. Another difference is that my remix does not adhere to the conventions of nineteenth-century Romantic style, but instead explores a stylistic realm that might be described as experimental electronic music, a mode of musical expression that leverages the potential of recent technologies to reshape existing sound in new and exciting ways. In short, Stephen Rodgers and I share several musical concerns, in that we begin with the similar objects of study and we work with these objects with similar questions in mind—such as how to create smooth transitions between two musical settings. However, our techniques and our results are distinct: although we proceed in the same spirit, we transform our objects of study in fundamentally different ways. I should also note that another common term related to what I am doing is the word mashup. A mashup involves combining elements of two or more pre-existing compositions to form the basis of a new composition.3 However, in my compositions I go several steps beyond simple moves of borrowing and recombining. The two recordings I selected provide ample opportunities for blending their audible features. Since the beginning of recorded sound (during the late 19th century), technology has enabled people to restructure the traditional listening experience. Such alteration became more common and accessible due to technological advancements. The audio techniques I use in breaking down and reassembling recorded audio files provide special opportunities and challenges. Two attributes are crucial: First, electronic music is predicated on principles of sonic transformation. One sound can become another sound. Second, electronic music allows not only for the transformation of sound, but also for the transformation of the way time is articulated and experienced. Time, for instance, in electronic music, can literally be stretched, compressed or even reversed, creating musical outcomes that are not remotely possible in the acoustic domain. Before presenting my remix, I will discuss a few examples of how I applied the electronic music techniques of filtering, time-stretching, crossfading, and looping within my remix process. In this example, lower frequency components of the recording are attenuated so that the higher frequency components can be heard more clearly. This move leaves additional compositional space in the lower frequency spectrum that I then use to place a time-stretched E chord in the low register of the piano, below the high-pass filtered vocal phrase. Time-stretching can be explained as the “slow-motion” re-articulation of the original experience of the composition; it slows down time to allow musical moments to be more fully appreciated. The two words of line two which the poem stresses through spondee, “ist Ruh,” are stretched further in order to emphasize what I view as the most important words of the poem. As Goethe already realized, time-stretching helps the listener to experience more completely the sonic details that would normally pass by too quickly. 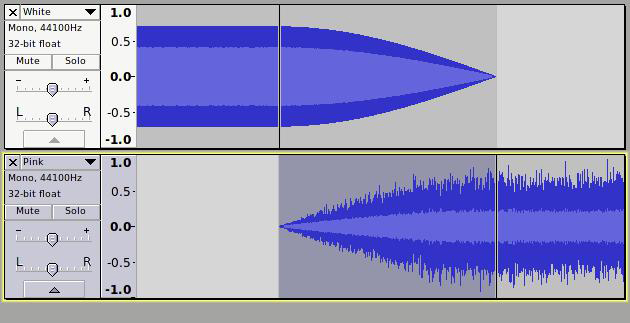 The crossfade audio technique allows one sound source to diminish in volume (fade out) while a second source simultaneously grows in volume (fade in). Here is a visualization of the crossfading of two sounds. With time progressing from left to right, notice how the narrowing of the top sound shows that it is getting softer, while at the same time the bottom sound widens because it is getting louder. Crossfading is a particular type of contrapuntal device that occurs frequently in music that employs electronic music technology. In musical example 3, the first phrase of Hensel’s setting is crossfaded with the first phrase of Schumann’s setting. Because the first phrase of Hensel’s setting ends with a G# and the first phrase of Schumann’s setting begins with a G-natural, a dissonance would have occurred if both phrases were left un-transposed. 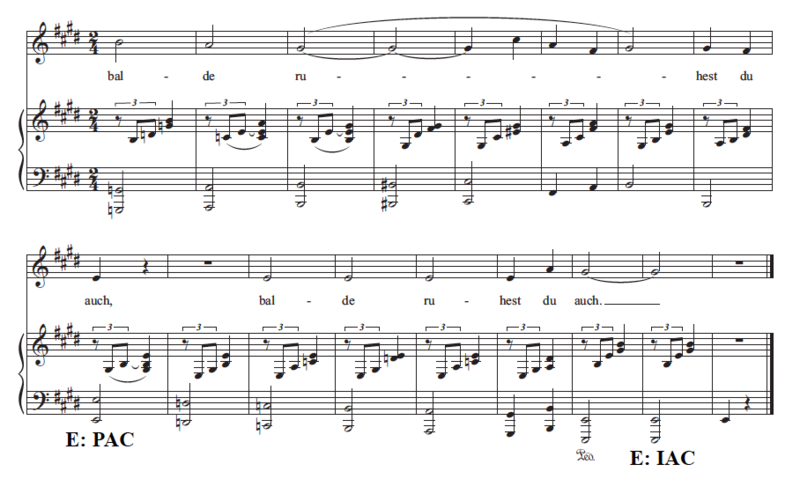 In the remix, I transpose Schumann’s first phrase up a half-step which helps the remix maintain a sense of continuity. A loop can musically function in ways similar to how an ostinato functions in traditional acoustic composition. If it is short in duration, the loop appears to be a glitch in time. This is the sort of loop that occurs in the third phrase of my remix. Composing an acousmatic electronic remix is a multi-step process. It involves 1) analyzing the original songs by conventional means, 2) analyzing the audio recordings of the performances of each song, 3) partitioning those audio recordings into edited audio segments, and finally, 4) sequencing, layering, and mixing the audio segments into a remade and reconceptualized composition. Analyzing the musical score of an art song setting shares certain attributes with analyzing a recorded performance of a song setting. Analyzing a musical score opens the door to possibilities of deconstructing a piece of music into its component parts, such as notes, harmonies, melodies, rhythms and forms. In preparation for my remix compositions, I analyzed and disentangled the complex web of relationships between the associations of pitch, harmony, timbre, musical dynamics and many other musical elements, in addition to textual and extra-musical meanings. The smallest module one can work with is a snippet of recorded sound, where the five basic characteristics of sound — pitch, timbre, volume, duration, and spatial location — are in fixed concrete relationships. Beyond disentangling these complex sonic relationships, it is essential for composing a remix to understand how such associations unfold over time and to identify the moments where previously unconnected materials can be connected, juxtaposed and entwined to shape a unique musical expression predicated by contemporary technologies. Each sonic segment can be reimagined to reveal its aesthetic potentials. What the original music, both musically and textually, reveals is a sense of longing that is never satisfied. Even at the end of each song there is no emotional resolution. The words unfold within flowing musical gestures and express with some kind of unease a longing for eternal tranquility. Both musical settings contain similar harmonic progressions, similar pacings, similar types of evaded cadences, and similar shifts in tempo. These observations stimulated me to reimagine and develop a new sound world that adds to the original compositions. In order to rearrange short segments of the audio recordings I first cut these recordings into tiny particles in a process called granular processing. Secondly, I transformed the familiar timbres of voice and piano into new sonic manifestations that resemble sound over telephone lines. And finally, I stretched short moments in time into grand crescendos where each microscopic timespan can be fully inspected and absorbed by listeners. These transformational processes provide aesthetic windows into the sonic spirit of the original sounds and offer moments of sonic beauty only possible in the 21st century. The process and techniques used in creating a remix are fundamentally different from the process and techniques employed in recomposing two songs in a 19th-century style. For Stephen Rodgers, analytical recomposition works directly with notes, altering them to make “stylistic connections that we may have sensed but were unable to articulate.”4 My goal, on the other hand, in using remix techniques is to transform the existing world, as represented in the original audio recording, into newly imagined worlds. Audio worlds are subjected to transformational processes that are only made available by the rise and availability of recent technology. 3	Michael Geoghegan and Dan Klass, Podcast Solutions: The Complete Guide to Podcasting (CreateSpace Independent Publishing Platform, 2005), 45.